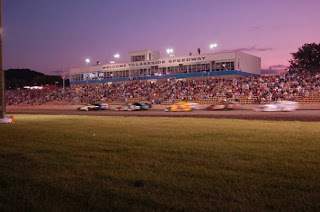 Elko Speedway just announced "MN Motorsports gives back" charity event. NASCAR drivers AJ Allmendinger, Clint Bowyer, Greg Biffle and Jason Leffler are scheduled to appear and have an exibition race. THURSDAY July 9th is the date of this big event. The Elko "Dirt Nationals" begins the next day. Raceway Park owner Donny Reuvers was a great interview on "Speedtalk on 1360." He said his main focus for 2010 will be Raceway Park but is not ruling out racing the full ASA Midwest tour schedule. He will run the first couple races and make a decision from there. 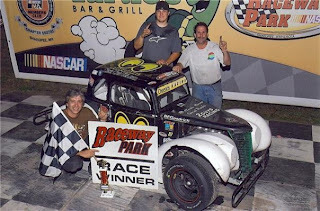 Raceway Park is adding quite a few Friday night shows in 2010 and will have a 10 race schedule with the crowd favorite Flat Track Motorcycles. Enduro drivers also expressed interest in racing all the Friday night shows. Jordan Bianchi broke the news that Denny Hamlin will be having knee surgery on "Speedtalk on 1360" ... we broadcast that information before Speed Channel. Both Jordan and Jason are picking Jimmie Johnson to win at Martinsville and Dean will go with Tony Stewart in the race for the speedworksdiecast.com fantasy NASCAR prize. Raceway Park owner Donny Reuvers will be joining Jason and Dean on "Speedtalk on 1360" on KRWC radio Saturday (March 27th) 10-11am. As a driver Donny Reuvers has about 10 track championships total on his resume' when you count both Raceway Park and Elko Speedway. He also has won MN State NASCAR titles and was runner up in the point standings for the ASA Midwest tour in 2007 and 2008. Donny is just completing his first full year as owner of Raceway Park, the 1/4 mile asphalt track in Shakopee and is known as one of the "nice guys" in MN auto racing. Listen to that interview on KRWC radio 1360am or http://www.krwc1360.com/ . "Speedtalk on 1360" is every Saturday from 10-11am. Great North Legends owner Tim Brockhouse was on Speedtalk on 1360 Saturday with Jason and Dean. Great North Legends will race full time at Raceway Park in Shakopee, Elko Speedway, I-94 Raceway in Fergus Falls and Buffalo River in Glyndon MN. The Great North Legends in conjunction with Click Club USA will have a 2010 Challenge Series with five events on the schedule so far. Two races at Raceway Park in Shakopee, one in June and one in July. 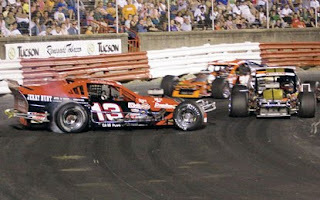 The Elko race will be in August and then back-to-back races in Wisconsin in August at Wisconsin Dells and Marshfield. $5000 point fund and $400 to win each race. A Super Late Model team from Green Bay WI will be renting a Legend car to race in the $1Million race in Charlotte NC, he anticipates about 8 Minnesota drivers will make the trip. Tim Brockhouse is working on scheduling a roadcourse race in Brainerd in the near future. Former Legends champion Dirk Henry is engaged to be married. * youtube video of Tim's car going up in flames at Bethel awhile ago. "Speedtalk on 1360" weekly guest Dan Plan from the Midwest Racing Connection did a "Racin Roundtable" pod-cast with Stan Meissner on the Midwest Racing Talk web-site. Here is a link to that Pod-cast of Dan talking about: his racing background, newspaper, the state of local racing, USA Dirt Nationals, the Elko dirt track and moto-x, WoO schedule, and much more. 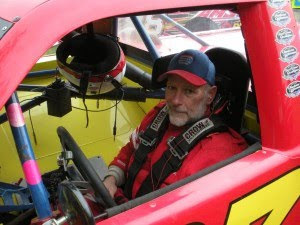 Tim Brockhouse on "speedtalk on 1360"
Great North Legends owner Tim Brockhouse will be on "Speedtalk on 1360" with Jason and Dean this Saturday March 20th on KRWC radio 1360am. 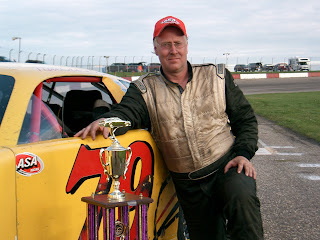 Tim has won over 65 races in his career as a driver and his son Jayson won 15 races in 2009 while winning the point championship at both Raceway Park and Elko Speedway. Tim now spends most of his time in an ownership roll of the "Great North Legends" dealership that sells and services all Legends cars in the upper Midwest. Tim will talk about the big ONE MILLION DOLLAR Legends race at Charlotte Motor Speedway, what tracks Legends cars will be racing at in the upcoming race season in Minnesota and a very special announcement you will hear only on Speedtalk! ASA Midwest tour president Tim Olson was on "Speedtalk on 1360" with Jason and Dean on Saturday. *The 2010 ASA Midwest tour champion will get an invite to drive a bobsled for Geoff Bodine in his charity event next year. *The Matt Kenseth/Tony Stewart All-Star event on Tuesday June 29th at Madison Int Speedway will be an ASA Midwest tour points race, plus other changes to the schedule. *The ASA Midwest tour truck series will be racing at Elko during the ASA Midwest tour event on June 5th. *A Kenseth will be running full-time in the ASA Midwest tour this summer. ASA Midwest tour president Tim Olson from Delano MN will appear on "Speedtalk on 1360" this Saturday (March 13th) with Jason D Searcy and Dean Reller. Tim is a former Super Late Model champion at I-94 Raceway and just got back from South Africa after competing in the first ever stock-car race in that country. Tim will talk about the upcoming ASA Midwest tour season and will announce the long awaited schedule for the new ASA Midwest tour Truck series. Listen to KRWC radio 1360am or "on line" at http://www.krwc1360.com/ on Saturday from 10-11am. Win-tron racing co-owner Nate Thiesse will appear on Speedtalk on 1360 this Saturday (March 6th). 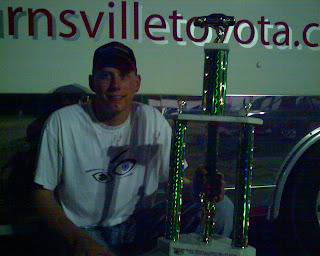 Win-tron is a Minnesota based race team that won the ARCA race last weekend in Florida with driver Justin Marks. Many of you have seen the racing based reality TV show on History channel from Bowman-Grey Stadium in Winston-Salem North Carolina named "Madhouse." This is a show featuring the Modifieds that race on a 1/4 mile flat asphalt track in a stadium. This show was on at 10pm Central time on Sunday nights but I heard it will not be back on "the History channel" next year, they are looking for a new TV Network for the show. But now beginning soon a new dirt Modified show will be broadcast on the Discovery Channel. Its called Heartland thunder from Lakeside Speedway in Kansas City KS. Interstate Truck driving school has two locations in MN: South St Paul and St Cloud. They are owned by Bill Collins who is a big motorsports supporter. If you are looking for a new truck driving job or know someone who is, tell them about Interstate Truck Driving school, a main sponsor of Speedtalk on 1360 and great friend to motorsports fans in Minnesota.